The Model 6378 is a concealment version of the all new Automatic Locking System (ALS®) series holster. Once the weapon is holstered, it "locks" into place, providing an extra measure of security from the standard open top holsters. A simple straight draw is possible once the ALS is de-activated by your thumb while obtaining shooting grip. IDPA approved. The Model 6378 features an all new injection molded paddle design that is highly concealable and rides close to the body with a slightly forward weapon cant. It also comes standard with the 567BL belt loop, fitting 1.5" to 1.75" belt widths. Additionally it features suede lining to help protect the gun's sights and finish. Its SAFARILAMINATE structure with wraparound design provides the strongest design combination available. Available in STX Plain Black and Carbon Fiber Look. Doesnt seem to fit my weapon. Seems loose. I love the ALS system. The holster is easy enough to get on and off on the fly. Good buy for a good price. This is not my first Safariland ALS holster purchase but my third. I have them for my FS M&P and another XD. If you are looking for a OWB holster and level II retention is a must have, that also offers very good gun coverage, and holds the gun close to your body and allows lightning fast draws and re-holstrering then give Safarilands line of ALS holsters a look. At this price I very seriously doubt you will find as good let alone a better holster. My 5" XD tactical is a big firearm and when loaded with 14 rounds of 230grain JHP ammo hevior than most other HGs but when paired with a good belt it keeps my 5" 45 XD in place next to my body with slop free rock solid retention. I can't recommend this holster highly enough. This is my favorite holster for sidearm carry of a large semi-auto comfortable, functional and a great level of retention on the pistol while holstered that allows for a speedy draw. Has an exterior look of leather rather than plastic, and is lined for protection of finish on pistol. Perfect. Works as expected. I use it with paddle and als for a bit of offset from the body. Exactly what I expected. This is the second holster for me in this configuration. Swapped out belt loop for a different one, since I use it for patrol. Purchased the als system because having to reholster and secure gun with snap was pain. ALS locks in pistol automatically, so I can use cuffs fast. Plis fast on the draw when bullets start flying. Only negative for me, wish safariland made it in basketweave. The holster provides a secure fit and excellent retention, the best I've seen yet in a holster made for a light bearing pistol that wasn't custom built. The price is cheaper than anywhere else I've found. Well done Safariland and well done CopsPlus. It's durable and simple. It meets the needs of the department policy with retention and allows for the light attachment. Just wish there was a better belt loop attachment then the one they offer. Sweet holster. Easy lock, easier draw. Great off-duty option for my duty weapon. Due to the size of the weapon it's more of a fallwinter or low-conceal option, but it is quite comfortable. The action squeaks a bit but it holds my firearm tightly and releases just fine. Release takes some significant practical and many evolutions to become smooth and consistent in your firearm presentation. Great idea. Fit was perfect for my pistol. I've got 4 of these in various configurations. No issues other than I had to remove some material around the thumb latch to give me a little more leverage to release the lock, otherwise it would get 5 stars. No complaints other than that, but you may not have an issue. Very fast and natural draw stroke. Good intermediate level retention. Much improved over the rotating hood as long as you don't need extraordinary retention levels. Awesome holster, easy transition from my 6360 that I use on duty. 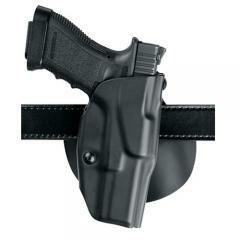 Excellent quality and well built holster. Exactly what I needed. Holster works perfect with Sig P229 with TRL-1 attached. It's description is true to the word. Rides close to the body and i have no issue with concealing my gun. It's nice both paddle and belt loop come with it. Very safe and secure way to carry 1911 type pistol "cocked and locked". Holster is designed with enough room to fit pistols with adjustable sights and extended thumb safeties. Great product Safariland will never let you down and if they do let them know and they will make it right. will this fit a glock 30s? You can select "Glock 30 (3.78" bbl)" for your firearm. Does this holster come with a belt attachment or can you get one? How low of a draw is this holster? Will this fit a Remington 1911-R1? Yes, select "Colt Government 1911 (5" bbl)" as the fit.